베로나, 이탈리아의 리바콜타 B&B | 호스텔월드에서 예약하세요. Immersed in the tranquillity of a large walled-in garden, the B&B is located next to Verona, recently awarded the status of a World Heritage Site for its breathtaking range of art-works and monuments. Rivacolta House offers the ideal accommodation for your business trips due to its close proximity to Verona Fiere, the Exhibition Centre which manages about 30 events every year. In less than one hour drive you can find the principal cities of art of northern Italy (Padova, Venezia, Ferrara, Mantova, Vicenza, the enchanting Lake Garda) and many other centres of interest and amusement. 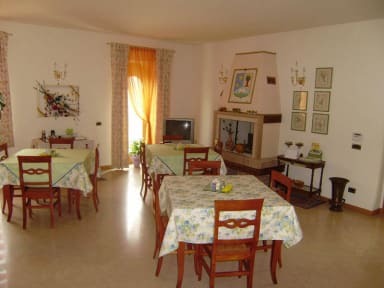 Rivacolta B&B provides comfortable accommodation with rooms characterized by charming touches both in the furnishings and details. Classic style furniture is mixed up with all the comforts and facilities of a modern house: private bathroom with shower, air conditioning, TV and Internet wifi. Our prices include buffet continental breakfast served in a cozy space, bed linen and towels, daily cleaning and outdoor parking.